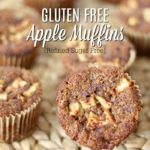 These healthy gluten free apple muffins are a delicious soft muffin naturally sweetened with honey and applesauce, and are spiced with the classic fall cinnamon spice. Healthy apple muffins are double packed with apple goodness and make the perfect breakfast or snack on the go. I wish you could smell our house right now. These muffins would be the ‘perfect come on over and enjoy delicious muffins’ kind of muffins. If I could invite y’all over to my house for an afternoon cup of coffee to eat these sweet apple muffins straight from the oven topped, with melted butter and honey as we enjoy the cool fall breeze and watch the kids run around acting a fool, I would. The only true way to eat a muffin is nice and warm with a pat of butter. Growing up, most Saturday mornings my dad would come home from working a 24-hour shift at the fire department with a box full of donuts and a bag of blueberry muffins from Dunkin’ Donuts. My mom would pop the muffin in the microwave, add a pat of butter, and it was insanely delicious. I always thought I hated donuts, but that was because I didn’t have a good one until adulthood. Like this little local place I was at last night with some friends. Magical donuts. Darn donut tangent… back to muffins. Can you tell yet that I’ve caught the baking bug? Part of it is I’m trying to food prep some meals and snacks for after the baby comes. Things that are easy to grab to eat one-handed while I try to distract a 2-year-old while having a sweet little leech attached to me 24 hours a day. 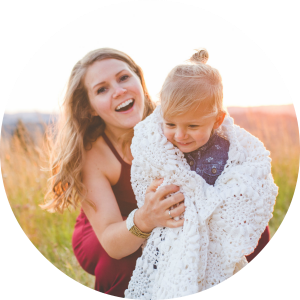 I want to make life as easy and the transition as smooth as possible after baby comes. Obviously, muffins will do just that for so many reasons. These healthy apple muffins are a soft muffin naturally sweetened with honey and applesauce and spiced with the classic fall cinnamon spice. Really delicious. Did I mention your whole house will smell fabulous? 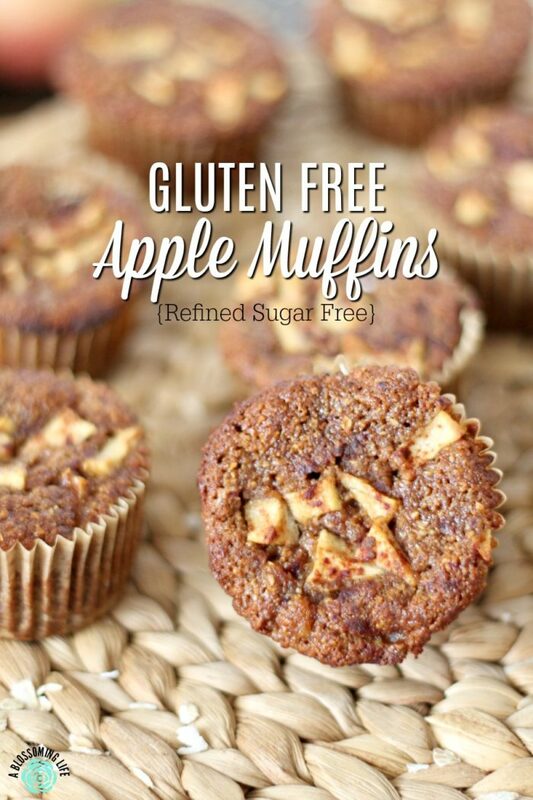 Why I love these healthy gluten free apple muffins! They are gluten free so everyone in our family can eat them. These muffins are naturally sweetened and made without refined sugar. Packed with healthy ingredients like apples, oats, banana, and healthy fats. They are double packed with apple goodness. Food processor (I have this one) or high speed blender, muffin tin (I just got this one), large bowl (my favorite set), measuring cups and spoons, and silicon spatula. Make your own oat flour by blending oats into a powder. The riper the banana the sweeter this muffin recipe will be. You can use honey or maple syrup interchangeably. Like your muffin tins with muffin liners to get them out easier. The best apples for baking are ones that are firm and don’t break down when baking. They also have a balance of sweetness and tartness. Preheat oven to 350. Grap your ingredients. Place cupcake liners in muffin tins or grease muffin tins well (I prefer the liners to make it easy). You could also use silicon liners as a zero waste option. Make oat flour by grinding oats into a fine flour in your food processor or high-speed blender. Place oat flour into bowl. Add coconut flour, baking soda, salt, and cinnamon to oat flour and stir. Blend for 1-2 minutes until completely combined and smooth. Place into muffin tins until about 3/4 of the way full. Use an ice cream scoop or measuring up to make this easier. 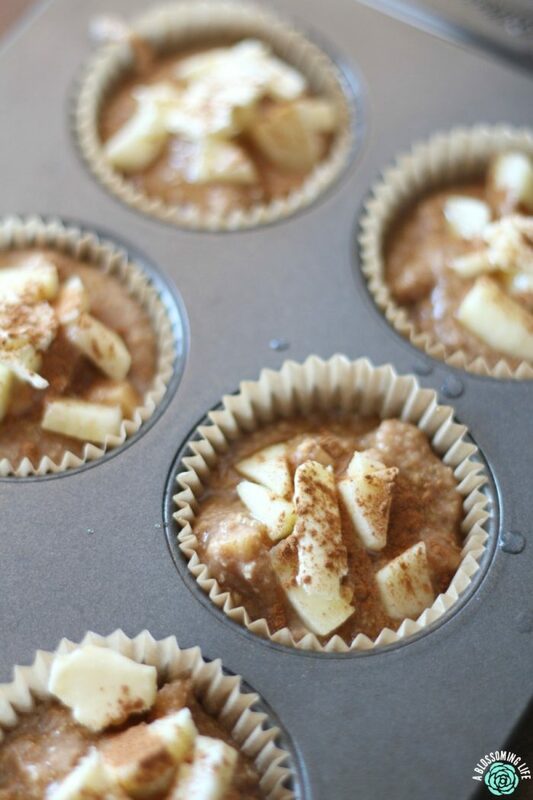 Top each muffin with diced apples, a drizzle of honey, a small dollop of butter, and a sprinkle of cinnamon. Bake for 30-40 minutes until you can insert a toothpick and it comes out clean. Are these apple muffins healthy? 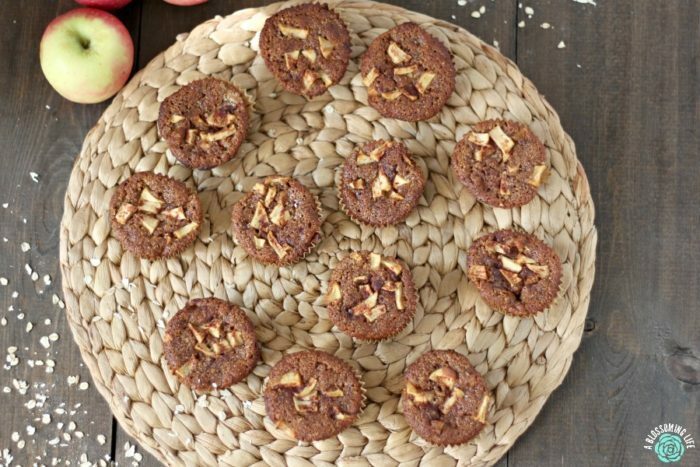 Basically, all around these apple muffins are really healthy and have I mentioned delicious? Gluten Free Blueberry Pie is a staple during the summer and uses my favorite gluten free pie recipe. These Gluten Free Sheet Pan Pancakes have been life changing and make breakfast super simple. Chocolate Whipped Cream anyone??? This is one of our favorite recipes that we make weekly. Blackberry Banana Breakfast Bread is a delicious recipe perfect for the summer when we have blackberries coming out of our ears! These apple muffins are a healthy, soft muffin naturally sweetened with honey and applesauce, spiced with the classic fall cinnamon spice. Really delicious... and did I mention your whole house will smell fabulous? Preheat oven to 350 and grease muffin tin or place cupcake liners in tins. In a blender or food processor, make oat flour by grinding oats into a fine flour and place into bowl. Add coconut flour, baking soda, salt, and cinnamon to ground oats and stir. In the blender, add banana, applesauce, oil, eggs, and maple syrup. Blend for 1-2 minutes until completely combined and smooth. Stir wet ingredients into dry ingredients and fold in 3/4 of diced apples. Place into muffin tins until about 3/4 of the way full. Do you love apple season?